Typical Tank setup: A lot of swimming space is necessary. Decorate with rock work, bogwood/driftwood and sturdy plants. An agitated Asian Arowana may uproot plants with poor root systems. Recommended Minimum Aquarium Capacity: 55 gallon / 220 litre for juveniles, but a fully grown adult will need an aquarium that is 250 gallon / 1000 litre or larger. Compatibility: 6 or more juveniles can be kept together, but 10 or more is better. The same with adults, but this is a gamble as some adults do not tolerate others of their own kind well. Beside keeping them in schools they should be kept with peaceful to moderately aggressive fish that cannot be eaten and that will not harass the Arowana. Feeding: Juveniles will readily eat small fish, tadpoles, live brine shrimp, live brown worms, small earthworms and other live foods, but should be trained to accept pellets, sticks, chunk of frozen foods, chopped and whole market shrimp, and other meaty foods. It is not only less expensive to feed an Asian Arowana prepared foods instead of feeder fish, but it is also healthier for it too. 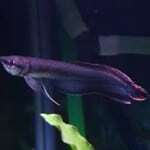 Breeding: Asian Arowanas are mouthbrooders and are readily bred in large ponds, but rarely in aquariums. Additional Information: It is critical that the aquarium has a tight fitting and secured lid that is extremely strong. Arownas are avid jumpers and can easily knock a heavy glass lid onto the floor! Many an Arowana has been lost this way. They do not tolerate poor water quality, so excellent filtration along with frequent partial water changes of 25% or more is required to keep nitrates low. Their tank should be placed in low traffic areas to keep the Arowana from getting frightened by sudden movements. Sudden movements around their aquarium should be avoided. Lighting should preferably be dimmed instead of suddenly turning it on or off. A scared or agitated Arowana can easily injure itself. 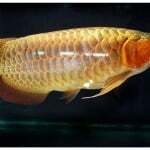 Asian Arowana variants include Cross Back Golden, Super Red, Red Tail, Golden, and Green Arowana. 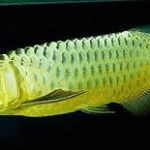 The Cross Back Golden Asian Arowana originates in West Malaysia. These are in the highest demand, as it is believed they bring extra good fortune. Cross Back Golden Asian Arowana have been called Pahang Gold, Malayan Bonytongue, Bukit Merah Blue, Taiping Golden and the Malaysian Gold. They are quite rare and the demand is always high which brings the prices of these fish up to high levels. Cross-Back fins can be found in other color forms to like Purples, Blues, Red, varying Gold, Green, and Silver. The Super Red Asian Arowana originated in Indonesia (Western Kalimantan Province). They can mainly be found in the waters of Lake Sentarum and the River Kapuas, and are one of the most popular Asian Arowana due to their beautiful red colors. Super Red Asian Arowana is much more common than the Cross Back Golden Asian Arowana. There are 4 varieties of red Arowana, Blood Red, Orange Red, Chili Red, and Golden Red Arowana. The red color is first visible in the fins in young specimens and gradually moves onto their entire body as they mature. The Red Tail Golden Asian Arowana is found in Indonesia (Pekan Baru). 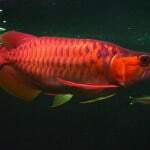 They are more common and more affordable than Cross-Back Gold Asian Arowana since they are more abundant in the wild, as well as the fact that they are not as “Gold” as the Cross-Back Golden Asian Arowana. 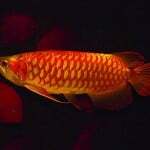 They are also a little more aggressive Cross-Back Golden Arowana which they otherwise have many of the same traits as. 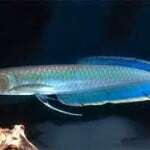 The Green Tail Asian Arowana is usually found in Thailand, Malaysia, Myanmar, Indonesia, and Cambodia. Due to the large coverage, there can be a lot more difference in these than in other Asian Arowana. Most are grayish green, and have a head that is larger and rounder then other varieties. Asian Arowanas are considered an endangered species in the wild and are listed on CITES. Fish that are purchased are not wild caught fish, but fish that are born and raised on fish farms, predominantly in Asia. Most are microchipped and come with authentication papers that state where the fish was born and raised and that it has been microchipped. They are not legal to keep or import into the U.S., along with some other foreign countries, due to their CITES listing. 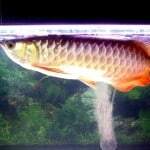 Check the laws in your area before attempting to purchase an Asian Arowana. 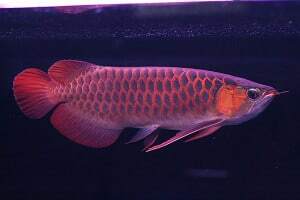 Red Asian Arowana is another popular variety of Asian Arowanas sold in Malaysia. The country of origin for the Red Asian Arowana is Indonesia. Thanks to the commercial captive breeding, this species is now being widely breed and sold in Malaysia. Four basic colour variants are Super Red, Chili Red, Orange Red and Blood Red. When growing into mature, the opercula, lateral scales and fin membranes of the fish turns into metallic red. The redder the parts show, the more mature of the fish is. 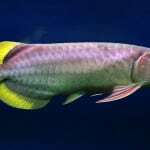 This entry was posted in Profiles Tropical All Fish, Profiles Tropical Arowana. Piranhas are attracted by noise, splashing and blood!